Solid evidence. Something an investigative journalist can sink his teeth into. That’s what I needed to see in 1971. Christians I had invited on my radio talk show to intimidate and make fun of were turning the tables on me. Me! A well-known, hard-core atheist talk show commentator, was actually listening to Christians talk about why they believed in the existence of God. Sound ridiculous? I thought so at the time, but they kept coming back with more and more evidence. For a free-thinking journalist interested in knowing whether something’s true or not, evidence is hard to ignore. What I was hearing about how archaeology supported many of the claims in the Bible was impressive. One of the most impressive was the discovery of the Hittite nation. 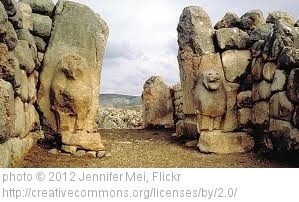 The Old Testament mentions the Hittite people almost 50 times, but who were they? There was no record of their existence anywhere in the histories of ancient cities and civilizations. Critics of the Bible believed the Hittites were nothing more than an invention of the writers of the Bible and there was no evidence to prove otherwise. That is, until 1876, when a British scholar made a discovery that led to the uncovering of the history of a great nation known as – the Hittites. Archibald Henry (A.H.) Sayce found inscriptions in Turkey that had been carved on rocks. He wrote about his find and the Hittite people in “The Hittites: The story of a Forgotten Empire” (New York, F.H. Revell Co. pref. 1888). Clay tablets were discovered at Boghaz-koy, Turkey about ten years later and German archaeologist and historian Hugo Winckler investigated the tablets and undertook his own expedition in 1906. Winckler and his team uncovered thousands of clay tablets that included a treaty between Egypt and the Hittite nation. Boghaz-koy was the location of the Hittite capital city and had been known originally as Hattusha. Winckler also found ancient temples, large sculptures and a fortified citadel. Tablets discovered in the temples confirmed many details about the kinds of treaties, ceremonies and regulations written about in the Old Testament. One of the things archaeological expeditions discovered about the Hittite civilization was that it began around the early part of the 20th century BC in the western part of Asia, an area known as Anatolia, now known as part of Turkey. Hittite kings expanded it into an empire by the 18th century BC and reached the height of power during the 14th century BC. The empire included most of Asia Minor, the northern Levant (Eastern Mediterranean area between Anatolia and Egypt, including Syria, Lebanon, Israel and Palestine) and upper part of Mesopotamia (Assyria). Abraham and his descendants encountered the Hittite people on many occasions in the land of Canaan. Abraham and his wife Sarah were buried “in the field of Ephron the son of Zohar the Hittite, the field which Abraham purchased from the sons of Heth.” (Genesis 25:7-10). Abraham’s grandson, Esau, married two Hittite women, which bothered his parents Isaac and Rebekah a great deal (Genesis 26:34-35). Jacob, the brother of Esau, was also buried in the field Abraham purchased from Ephron the son of Zohar the Hittite (Genesis 50:12-13). God told Moses during the 15th century BC that He would deliver Israel from Egyptian captivity and lead them “to a good and large land, to a land flowing with milk and honey, to the place of the Canaanites and the Hittites and the Amorites and the Perizzites and the Hivites and the Jebusites.” (Exodus 3:8) The Israelites had many dealings with the Hittites during the 15th – 12th centuries BC, supported by the archaeological findings that the Hittites were a powerful people in the region during that time. After the death of Moses, God told Joshua to cross the Jordan River and lead the people of Israel into their new home. God described where that would be: “Every place that the sole of your foot will tread upon I have given you, as I said to Moses. From the wilderness and this Lebanon as far as the great river, the River Euphrates, all the land of the Hittites, and to the Great Sea toward the going down of the sun, shall be your territory. No man shall be able to stand before you all the days of your life; as I was with Moses, so I will be with you. I will not leave you nor forsake you.” (Joshua 1:3-5) God did as He promised and gave Joshua and Israel victory over Jericho, the Amorites, the Perizzites, the Canaanites, the Hittites, the Girgashites, the Hivites, and the Jebusites (Joshua 24:11). However, Israel didn’t destroy the Hittites. In fact, years after Joshua’s death we see Israel living among the Canaanites, Hittites, Amorites, Perizzites, Hivites, and Jebusites. Even though God had sent Israel into the land to take it as their possession, they did not obey God. The Israelites took the daughters of these former enemies to be their wives and gave their daughters to be married to their sons. This intermarriage, which God had commanded Israel not to do, led the people of God to serve the gods of the Canaanites, Hittites, Amorites and other enemies of God (Judges 3:5-6). The Hittite empire collapsed into several small “Neo-Hittite” cities by the 12th century BC. Some Hittites were even serving in the Israeli army by the 11th century BC (1 Samuel 26:6; 2 Samuel 11:6). Those Hittites who had not been killed and were left in the land were forced into labor by King Solomon of Israel during the 10th century BC (1 Kings 9:20-21). Solomon disobeyed God and married many foreign women, including Hittites (1 Kings 11:1-3). According to The Joukowsky Institute for Archaeology and the Ancient World at Brown University in Providence, RI, the Hittite kingdom was the “first major imperial entity that had its core territories on the Central Anatolian Plateau.” The Joukowsky Institute for Archaeology has a helpful Power Point presentation about the Hittites online at http://proteus.brown.edu/mesopotamianarchaeology/1007 that includes many photos of the temples and city gates at Hattusha. For centuries, people laughed at Jews and Christians because of the Bible’s information about the Hittites. To me, as an atheist, the archaeological findings that supported the existence of a powerful people known as the Hittites was strong evidence for the genuine historicity of the Bible. How could documents written centuries before an ancient civilization was discovered and proven to be authentic by modern scientific methods have been fraudulent? How could the writers of the Hebrew Bible who lived well before the 1st century AD have known a powerful nation existed that was not known to exist centuries later by any other means except that the writings of the Bible were true? At least about the Hittites! And if the ancient writings in the Hebrew Bible were true about the Hittites, what else about those writings might also be true? Could what the writers of the Hebrew Bible wrote about the existence of God also be true? As I continue to share about more archaeological finds that support information found in the Bible, here are some of the books available to me in 1971 that you may find helpful in your study. I will share more recent archaeological finds, books and articles in future posts. May The Lord Jesus Christ Bless you! This might be of interest to those who want to champion the Bible with truth and integrity. http://www.christianorigins.com/2005/02/hittites-and-legendary-critics.html In TRUTH, there were very few, if any, serious academics who declared that the ‘Bible Got It Wrong With The Hittites’. That said, the general consensus among atheistic critics was that EVERYTHING in the Bible was up for criticism…. which meant that UNLESS someone actually dragged evidence and proof out of the dirt, the general attitude was that the Bible was just a pack of folk tales and lies. That view; that the Bible is just a pack of folk tales and lies, still prevails among most atheistic critics to this day. I’m supposed to believe in a book filled with ancient myths, only because it includes some historical details which ARE true? That would be like believing epic of Gilgamesh as truth, simply because ancient Uruk has been discovered. No joke. Believing in something with eyes wide open takes time to investigate, confirm and understand. I’m sharing the process I went through as an atheist to come to faith in Christ 42 years ago. Each post includes a part of that process. Any part by itself would not have convinced me, but when all the pieces came together I saw the Bible and God in a new and unexpected way. As a journalist and freethinker, the evidence was overwhelming. No joke.